Could an online picky eating course really help us? I have a confession – I used to hate mealtimes. J has always been a very picky eater and I would desperately try to make something he would eat, feel tense the second I called him to the table and hold my breath to see his reaction. It would then usually descend into some kind of questioning, exasperation or altercation. If any of that sounds familiar, you are probably dealing with a picky eater too and know how I felt. It wasn’t just affecting our meals at home but days out and packed lunches too. It had got to the point that I couldn’t find any kind of protein, apart from yoghurt, that he would actually eat on the go! Between what he could he eat due to his allergies, and what he would eat, I felt like my circle of ingredients was constantly getting smaller and smaller. Due to J’s allergies, we have seen multiple dieticians over the years and they have all told us similar things about his picky eating. He just needs to: see you eat it/see his friends eat it/be shown it 10 times/cook with you/have it hidden in other foods/have it on his plate/try one bite. Literally none of these things worked for us. I was feeling frustrated, defeated and tired of the constant battle. Then I heard about Jo Cormack’s 60 day picky eater program. I was sceptical about how useful an online course could be but I read some of Jo’s posts and she just seemed to be speaking directly to me. Finally someone that seemed to get it! She also has the credentials – she is a trained counsellor and works with families to unpick the psychological side of picky eating. She has also written a book about supporting feeding in early years settings, is working on a PHD and is a mum and foster carer. The course title says 60 days but that is just a guide and you can work through it at your own pace. 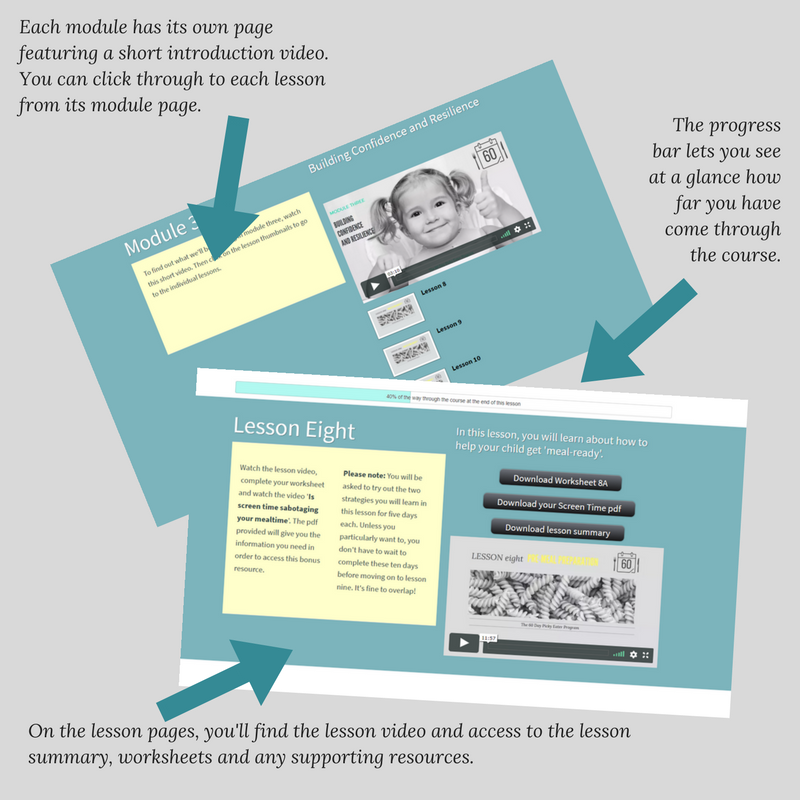 It is broken down into 6 modules containing 20 audio lessons with slides and supporting worksheets and resources. I really liked the organisation of it and the worksheets that you could apply practically to your own situation and write down everything to process it as you move through the different modules. The first module talks about food anxiety, sensory processing issues and how your child’s brain is working. I felt great relief listening to this as it just described everything I saw in J and helped me understand it more from his perspective. I have been told so many times just to make him eat it or not give him any other options and this was the first time I felt like my experience and feelings about J’s anxieties were validated. I found the the next module quite challenging as it makes you look at your own behaviour, your history with food and how you are influencing the situation. It’s important to understand the impact your words and actions can have on your child and it made me realise how emotional my own response has become to J’s eating. The next couple of modules talk about setting the scene for family meals, what you should and shouldn’t be doing and how you can change the environment to help you child. Again, this challenged my thinking and we have made quite a few changes at home which have impacted the next steps. One of those is doing more ‘family style meals’ where the meals are more deconstructed and the children can choose what they put on their plates. I had never heard of the division of responsibility before but there is a lot of research into it. The basic idea is that you are in charge of what food you serve but your child gets to choose what and how much they eat. So no bribery, no force feeding, no bargaining! To be honest, I didn’t like the idea and still find it quite hard but I can actually see the physical release in J as the pressure has been taken off. He is more relaxed at mealtimes and I am too. It’s not until the final module that you finally learn how to start introducing new foods to your child! This can be frustrating earlier on in the course when you just want the answers but once you get there, it all falls into place and you understand why the rest of it is so essential. I loved the practical element of this and the really useful worksheets. Jo takes you through how to gently challenge your child’s food anxieties and boundaries. She then helps you understand how you can slowly and methodically introduce new foods and build a longterm plan. 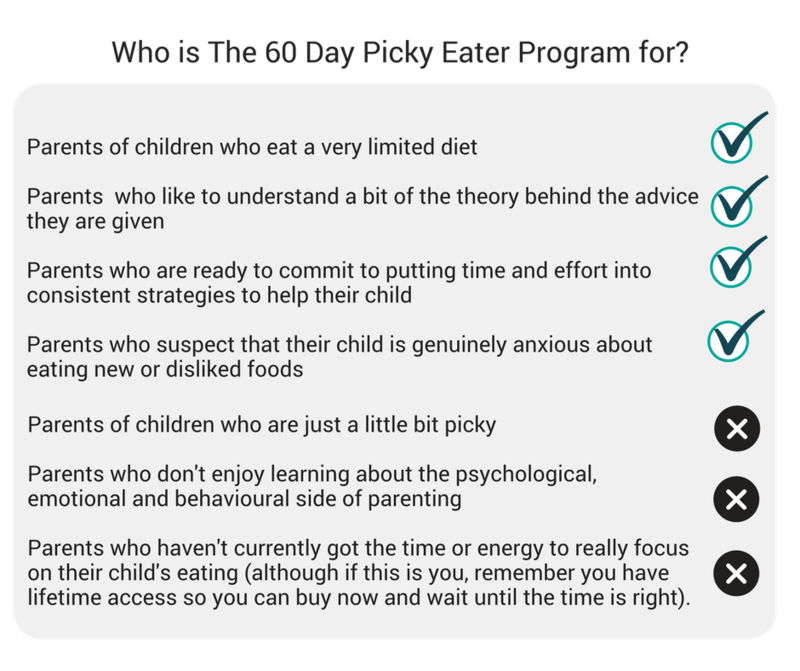 Should you take the 60 day picky eater program? This is not a quick and easy solution. It takes time, commitment and a new way of thinking. But it’s so worth it. I feel quite emotional writing about this as J’s eating had been causing me so much stress and anxiety and I had no idea how to break through it. I felt stuck, like it was my fault and embarassed that I couldn’t get my child to eat. Thanks to this course, my thinking has changed, J has changed, and our family mealtimes have changed. The 60 day picky eating program costs $399 (about £300), which is clearly a significant investment but I wouldn’t be recommending it if I didn’t think it was completely worth it. I don’t know where you could get the same help for that kind of price. I had never been given anything like this kind of insight and help through dieticians or other health professionals. I always felt like they were dismissive, wanted to give us stock answers or solutions, or thought I was exaggerating or not trying hard enough. Perhaps if you went private you would get more personalised care but that cost soon adds up and involves appointments and less flexibility. The funny thing is, although Jo’s course is pre-recorded, you feel like she is listening to you! She uses practical examples of other families she has worked with and also has a facebook group you can join where you can talk to other parents going through it. We have already seen some small but significant improvements in J but it has also changed our eating as a family. I have started serving more meals that I enjoy eating as I am not solely focused on making sure it is something J will eat. This has made me excited about planning meals again and also benefited miss A as well as she doesn’t have the same food anxieties and is now being exposed to more foods on a regular basis. I have finished the course with a really practical and personalised blueprint of how I am going to approach J’s eating. 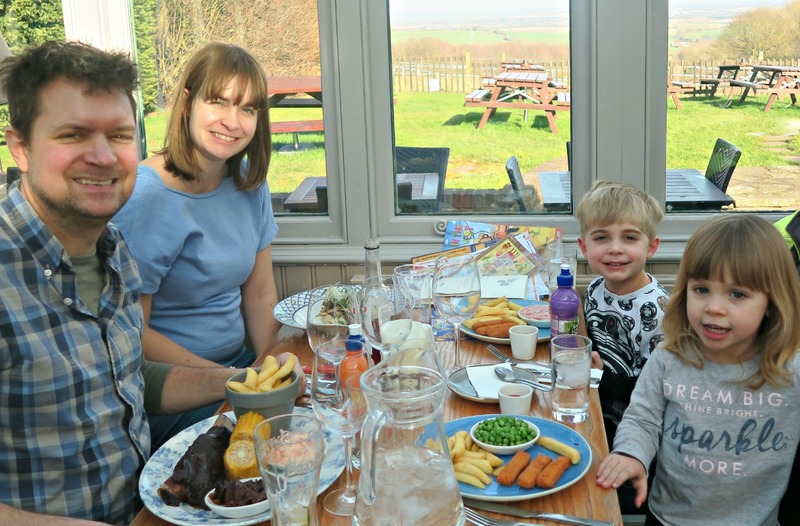 I now feel confident that I understand J’s picky eating, am approaching it in way that is right for him and our family and know the exact steps I am going to take to improve it. Disclosure: We were given this course free of charge to write an honest review. I was blown away by how much the course helped us and feel passionate about sharing it with others. I am now an affiliate for the programme and if you buy it, I get a commission but the cost to you remains the same. I know parents who’ve been driven to despair by picky eaters so great to know there is help out there!! !